These RimRock Budded Cross Earrings w/ Blue Turquoise with gold overlay scroll work throughout the design are a popular pick! Delicate in size and shape, these beauties are perfect for jeans or a night on the town. 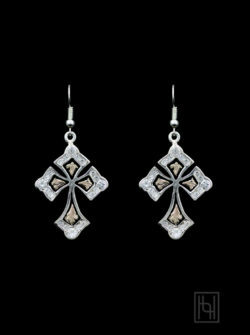 Black antique background provides contrast to the bright silver and gold precious metals.